The rush of the morning is over. My daughter has been delivered safety to school. My husband, long gone to work at an early hour. I sit at the kitchen table and take in the quiet of the morning. My house is silent except for the sound of our neighborhood sparrows and wrens softly chirping and cooing outside. A car ambles down the street, obviously not in any hurry. Morning sun streams across the kitchen table from the window promising a hot day. I move my hands into its warmth. I love that heat on my skin. This is what I missed during winter. My stomach groans and heaves as if throwing a tantrum, “I am hungry! Feed Me!” it says. I already know the answer is not much. The ends of some veggies, hardly any cheese, a couple of eggs. Well, that’s it then. An old fallback. 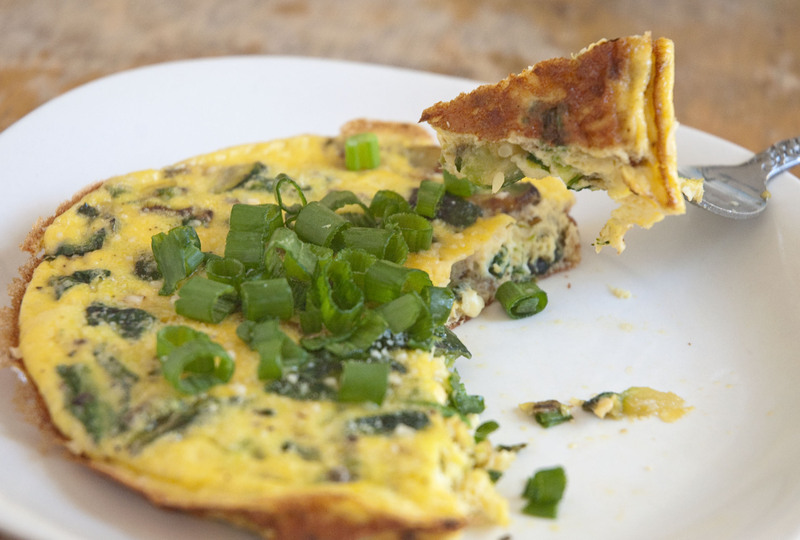 A frittata. Fast, easy and it uses up what is left in the fridge before market day. 1. Preheat oven to 350 F. In a small bowl mix two eggs, a small splash of milk, salt, pepper and a pinch of Parmesan with a fork until blended. Set aside. 2. Heat a small (6.5 in) cast iron skillet (or another stove to oven skillet) on med heat. Add a tablespoon or so of olive oil. When the oil is hot add the squash, sprinkle it with a little salt and pepper, then let it brown for about 5 minutes stirring occasionally. Add the white half of the green onion to the pan and cook for about 2 minutes. Reserve the green half of the onion for garnishing. Add the spinach and cook another minute or so. You want the spinach to be limp, but a bright green color. Remove from the heat. 3. Pour the veggies into the egg and mix together. Return the pan to the stove on med heat and let it warm up. 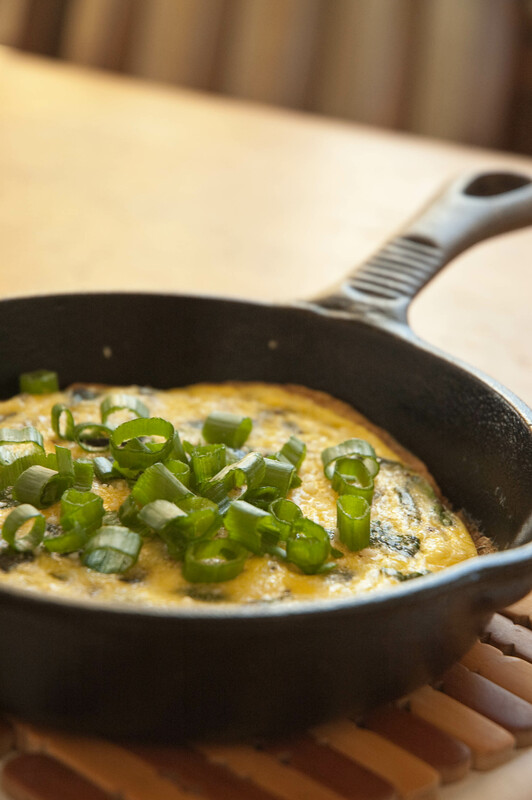 When hot, pour eggs & veggies back into the pan. Let cook, without touching it, until the bottom and edges have browned a little. The top and middle will still be eggy, but don’t worry. 4. Move the pan into the oven to finish cooking. It will take between 5-10 minutes. You will know its done when the center is just set. Let it cool a couple of minutes then, using a spatula, slide it from the pan to a plate. 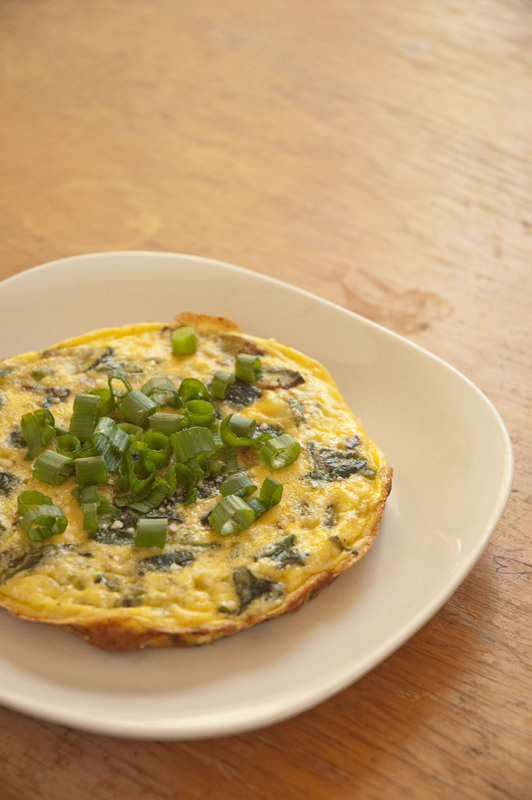 Top with another pinch of Parmesan and some green onions. Enjoy! Makes 1 frittata. Want to feed more people? Just multiply the ingredients by how many people you want to feed. And don’t forget to use a bigger pan! Yummy! Gorgeous pics as always! Mmm, gonna try this recipe tomorrow! Thanks! I made an omelet today but I also added some mushrooms and red pepper. It was delish! That’s what I love about this recipe. You can use whatever veggies you have on hand. I hope it got your day started off on the right foot. Nice! That seems like a great throw-together meal option that’s also pretty dang good-looking. Melissa, that looks really good. My wife recently mixed some leftover squash in our son’s scrambled eggs. I was hesitant, but really liked it. She suggested I put it in a fritatta (I’m the fritatta maker of the house). I may use this recipe because we usually have some spinach on hand. Thanks. I love squash. I think I throw it in most things during the summer. Let me know how the recipe works for you! 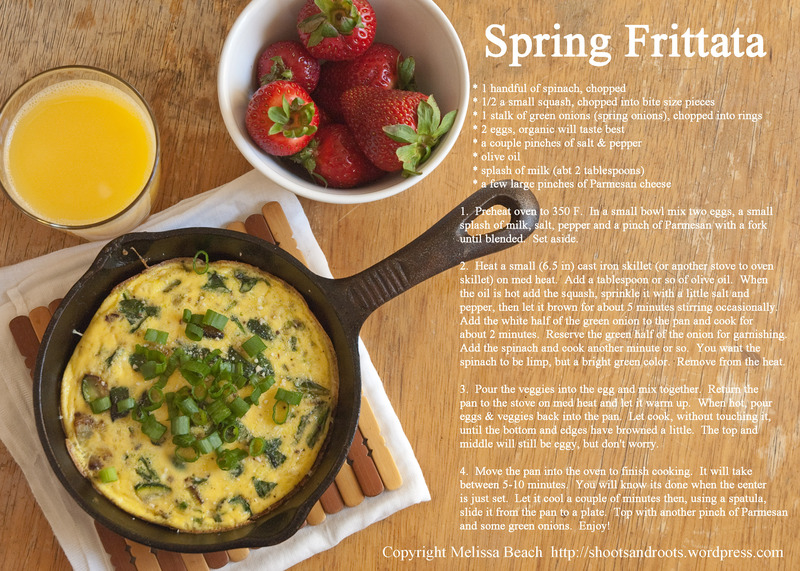 Love the frittata for one….must make this soon.